[4:09] <crziter> anyone got this problem? 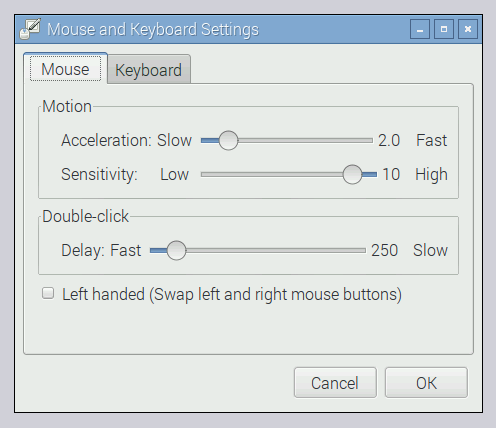 [10:23] <mike_t> user____, xfce4-mouse-settings ? [13:37] <Lartza> Out of power? [14:44] <fred1807> can I config a specific wifi network/ssid with static ip and leave others auto/dhcp ? [16:23] <rlange_> anyone having raspberry pi 3 built-in wifi issues even when wifi power management is off? [16:50] <NicoHood> I recently updated my raspbian and pulseaudio does not autostart anymore. If i do it via command line it seems the new bluetooth program may cause the issue. is anyone here aware of this? where can I report this bug? [16:59] <shiftplusone> NicoHood: this is explained in the blog post about the release. Remove the volumealsa plugin. [17:00] <shiftplusone> "If you are using PulseAudio for your own purposes, it would be best to remove the volumealsa plugin from the taskbar completely to avoid this – just right-click anywhere on the taskbar, choose ‘Add/Remove Panel Items’, and remove the “Volume Control (ALSA)” item from the list." [17:01] <shiftplusone> Note that pulseaudio doesn't work particularly well on the pi and adds unnecessary overhead by doing conversions on the cpu which the firmware can do itself. [17:02] <NicoHood> is there any other way to do it? [17:03] <shiftplusone> Doesn't that volumealsa plugin let you select usb devices too? [17:04] <shiftplusone> What's the device? [17:04] <shiftplusone> Does unplugging it and plugging it back in add it? [17:05] <shiftplusone> Okay, then knowing the device will help fix the problem. [17:06] <NicoHood> it works with pulseaudio though (pulseaudio is not started). [17:07] <shiftplusone> We don't have one of these in the office, so we can't really look into it, unfortunately. [17:09] <NicoHood> but well this is a normal usb sound card which should not differ much. also pulseaudio can handle it too. [17:10] <NicoHood> is there any information i could add to fix this issue? [17:13] <NicoHood> it does. may I pm you for the info? [17:23] <NicoHood> removing the panel makes pulseaudio work again. [17:23] <shiftplusone> yup, but that's more of a work-around. [17:24] <shiftplusone> I guess you're not user 'pi' and are not in sudoers? If so, that's a known issue that should be fixed soon. [17:24] <shiftplusone> are you in sudoers with NOPASSWD? [17:25] <shiftplusone> ah, yeah so that's the bug.... the shutdown helper uses sudo when it doesn't need to. [17:26] <NicoHood> is this bug filed? [17:26] <shiftplusone> it's fixed, but the fix isn't released yet. [17:27] <consolejazz> Any of you guys use config management tools to bootstrap your RPis? [17:29] <shiftplusone> NicoHood: the guy in charge of that seems a bit swamped right now, so unless we have one in the office I don't think it will get attention soon. In case he gets some free time, can I get your email to get information that might be useful? [17:30] <NicoHood> under contact.nicohood.de you can find all contact info you need. [17:33] <NicoHood> do you think pulseaudio adds a lot of overhead to alsa? cause I wanted to stream audio to the raspi originally. [17:35] <shiftplusone> There are a variety of reasons not to use pulseaudio, according to some of the kernel devs, but I don't know what those reason are exactly. [17:38] <NicoHood> pcm or ctl? [17:48] <shiftplusone> and what does amixer say? [17:53] <shiftplusone> Spoke to a kernel and kodi dev. Seems like a limitation of the hardware and driver itself. You can set up a virtual alsa device that handles resampling, but neither of us know the details. So it won't be an officially supported device and using pulseaudio may be a sensible option. [17:54] <shiftplusone> Now then.... home time. [23:22] <Gabe_> Does anyone even talk here?